Rick Williams was born in a small town in New York and is a husband, a father and a brother. He has a beautiful wife named Terri who at the mere mention of her name he spontaneously smiles and he’s a father to two amazing sons who he dotingly refer to as his boys. Rick is big on family and feels lucky to have two siblings; a sister and a brother. While in New York Rick was very active with the Boy Scouts and took pride in being a soccer coach for his son’s soccer team. After moving to Texas in 1989, he now considers himself a Texan but he still has a love for his New York Giants. Even being a Giants fan, Rick says he still wasn’t too big to not get cancer. “Yes, I’m a nine year Breast Cancer survivor”, said Rick. “My diagnosis was a shock and a surprise and totally caught me off guard…yes, my name is Rick; yes, I’m a man and yes, I have breast cancer! Surprise, men do get breast cancer,” he continued. It all started when he noticed a lump under his shoulder blade on his left side. Although anxious to find out what the lump was his anxiety was calmed when he realized he had an appointment with his doctor later that week. “What were days felt like weeks and I knew I couldn’t leave that appointment without asking my doctor to check out that lump”, he exclaimed. Rick went on to explain that the response his doctor gave was very telling but not nearly as telling as the test results, “I don’t think that’s normal, let’s get it checked out”, his doctor said. “I know what abnormal means, I just never thought I’d have anything abnormal in my body”, he thought. Well, that lump would forever redefine his normal. Rick’s doctor sent him to a surgeon to remove the suspicious lump. “One lump down, one mountain to go and my uphill climb was just about to begin”, he thought. A week after the lumpectomy the surgeon called and said, “I need to see you in my office and when you come bring someone with you”, he emphasized. Even before arriving to the doctor’s office I knew it wasn’t good, at some point I think my eyes stopped seeing and my ears stopped hearing, I knew the doctor was talking but all I remember him saying was, “You have breast cancer”! Thank God he paired me with a fighter…my wife and I simultaneously said, “What’s the process to beat this darn thing? And when do we start?” Rick’s fight started with having surgery to remove the cancerous lump and 13 lymph nodes, making him one cancerous lump and 13 lymph nodes lighter…fortunately the lymph nodes had no signs of cancer. “Knowing that I had breast cancer was hard but there’s only one thing that was harder…telling my children”, he explained. “How do I tell my children that I have breast cancer?” A question I have yet to figure the answer to but I was extremely proud of my boys because they took the same attitude as my wife Terri and I. In fact, I didn’t realize just how much they were in the fight with us until after I had surgery and finally started back driving. What would at first appear to be a normal day of picking my youngest son Matthew up from school turned out to be a proud daddy moment, Matthew was always wise beyond his years! As we prepared to cross the street to get to the car he turned to me, looked me in my eyes, grabbed my hand and said, ‘Daddy, I still have to hold your hand because you’re still sick!” I grabbed his hand in return and although I knew I was at the beginning of the road a weight was suddenly lifted as we crossed the street that day. 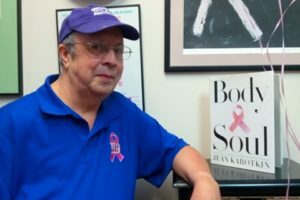 Rick realized that the road he was traveling wasn’t traveled by many male breast cancer patients but was traveled by many and he was grateful to be able to talk to other breast cancer survivors as he went through 4 rounds of chemotherapy and a month or radiation. While the chemo was harsh their advice was very kind, especially when one survivor said, “Word to the wise, never eat a big meal after chemo”, funny but so true, he giggled. Rick concluded by saying, “I never really thought about my purpose until I was diagnosed with breast cancer and to this day I’ll never forget my doctor saying, “Rick, you’re only the second male I know that’s had breast cancer” and my response to her was, “that’s an honor I can do without!” It’s that statement that made me realize that getting breast cancer was my calling and now my purpose is to talk to everyone I come into contact with and help them understand that “Men can get breast cancer! and I’m living proof!”.